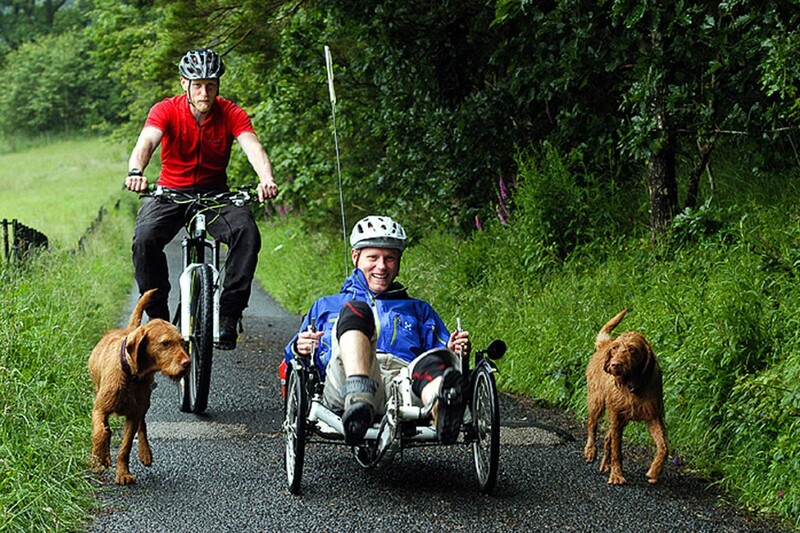 Every year, thousands of outdoor enthusiasts head for the UK’s uplands for the thrills to be had from hillwalking, climbing, mountain biking, skiing and all those other activities that provide an adrenaline rush and the escape from the humdrum modern life for a few hours. Most come back with happy memories, a few photos of their exploits or the views, and the warm glow of knowing they have had their own little adventure in the hills. But a few are not so fortunate. A badly timed slip, or a misplacement of a single step can lead to a fall and a call to mountain rescue. The UK’s volunteer mountain rescue teams are trained to a high professional level, despite being unpaid and largely reliant on charity donations. Rescuers seldom meet the casualties they have aided after they are dispatched to hospital, though many will make a volunteer to the teams as a thank-you for their help. 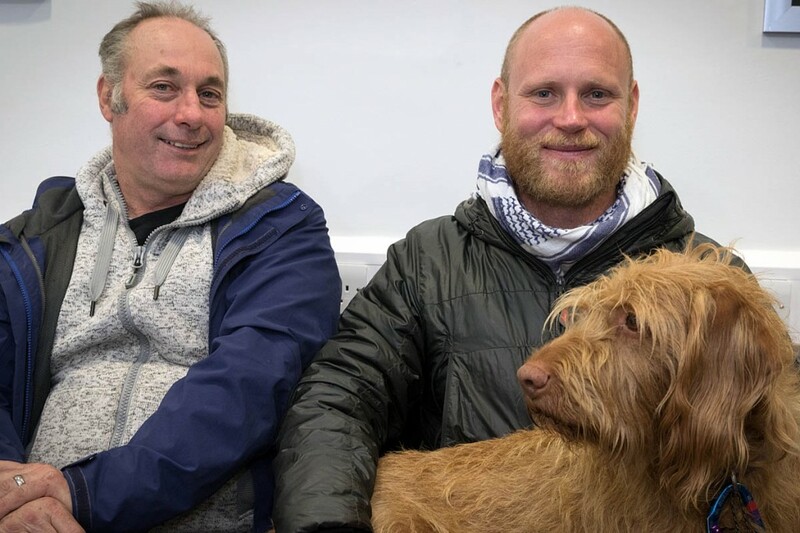 At the recent Kendal Mountain Festival, outdoors retailer Blacks brought together two men who were involved in incidents in the Lake District with rescue team members. The pair revealed their identities and stories to the rescuers before recounting their experiences during their ordeals to the gathered crowds at the event. 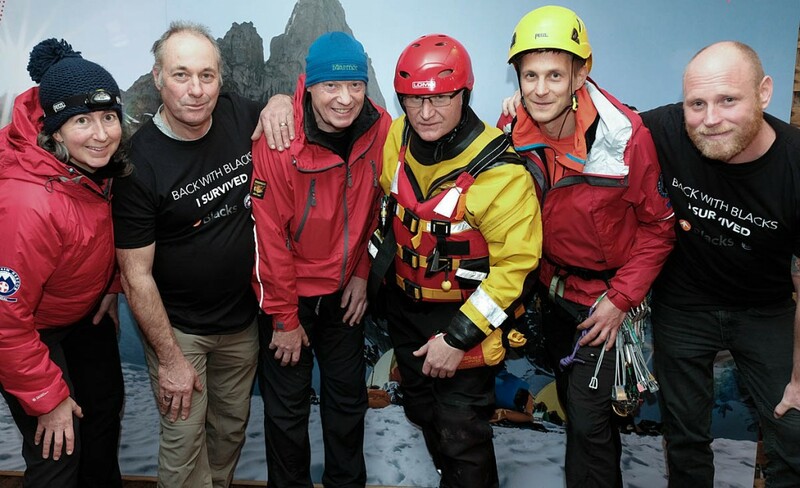 Blacks was the headline sponsor for Kendal Mountain Festival. 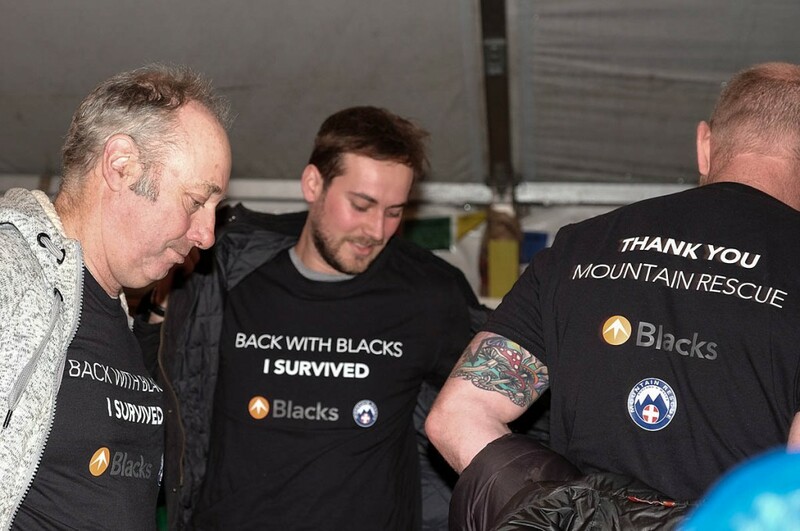 Blacks is owned by JD Sports Fashion, one of the biggest corporate supporters of mountain rescue through its registered charity The JD Foundation. Grough spoke to the men, who had very different tales to tell of their mountain accidents. John France was with a group of four friends who were swept down a mountainside by an avalanche on St Sunday Crag in February 2010. He was the only one to escape uninjured; one of the party received critical injuries in the fall. Joe Beaumont has little recollection of his accident in Eskdale. He fell about 40m (130ft) while abseiling and suffered life-changing multiple injuries. “The rescue was in Eskdale, near the quarry,” he said. “I was climbing with a partner and abseiling, but I can’t remember it.” He said the crag was only 12-13m high, when his gear failed to halt his fall, he rolled a long way down the hill. “It’s said I fell 40m. I went back a year later, on the anniversary of it. There are a lot of huge boulders that I hit, then kept on bouncing. “I have no recollection of the week before and the whole year after is still a blur. I hit my head pretty hard.” He said he wasn’t wearing a helmet. “I’ve had feedback about the incident from the partner who was there and really from mountain rescue – the Wasdale team. “I’ve got a detailed account because I went and spoke to the team and I spoke to the pilot of the helicopter and the crew of the 202 Squadron at Boulmer. They airlifted me from the scene to Whitehaven hospital, which is quite an odd choice, but they were fantastic. 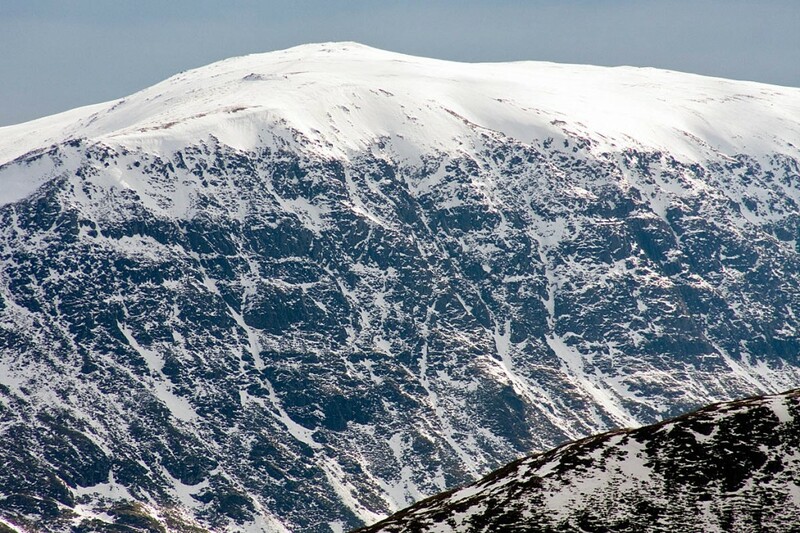 The 39-year-old, who lives near Ambleside, said he no longer climbs. “Kendal Wall sponsored me for two years. There’s part of me that still needs to climb and there are videos of me climbing with an external fixator on my leg and even with a gammy ankle afterwards as well. I’ve always climbed there. “I’ve got no elbow to speak of and no triceps so I wore a frame a friend built and I climbed with that, always top-roping. But most significantly I climbed Little Chamonix in Borrowdale and that was filmed as part of a bigger charity project I was doing in 2013. The list of injuries Mr Beaumont is quite horrific and those of a squeamish nature might want to look away now. “I had a compound fracture of the femur which has now got a titanium rod in it; I had an open fracture of my tibia and fibula; my foot was rotated round once; cracked ribs; but most significant is the arm, where the distal humerus has gone. It was shattered into countless pieces, by all accounts. “I can move my elbow, but it’s arthritic and grinds, but it’s getting weaker, so ultimately I’ll have an operation for an elbow replacement or a fusion which will just lock it in. No good for someone with my obsessions. “So I take painkillers and have a healthy attitude to life. “I hit the back of my head quite hard and had quite a large brain swelling. It was so significant that my family walked past me in the crash room; they didn’t recognise me. He said he had an Ilizarov external fixator – a limb-lengthening device – attached to his leg. “I lost so much bone; I had osteomyelitis in the bottom end of my tib and fib, so I was 2cm short in one leg. I had the Ilizarov frame for nine or 10 months. Mr Beaumont had a reunion with the Wasdale team about a year after his accident and also met the helicopter crew when undertook his Coast to Coast ride to raise cash for the rescuers. “There’s good catharsis that way,” he added. As well as the physical injuries, the former climber had post-traumatic stress disorder for a while. “It’s not the type that’s affected by memory, because I have no memory, but the body remembers. “I have a piece of rope that’s on my mantelpiece at home. It’s the bit they cut off; it’s full of blood. I was rooting round my garage in my wheelchair and I came across my climbing box with this orange bag that said biohazard on it, and it was full of my climbing gear. I didn’t know it was there. And I passed out in the chair. “I woke up 10 minutes later and went ‘oh God’ and wheeled myself back in. Over a period of a few weeks I’d get there and eventually I’d pick up pieces of gear and I used to get all-over chills but then I didn’t get any. So I was making myself aware that, you have to get over this. “It was weird, because it’s the most significant event you have in your life, but you have no memory of it. It’s quite rare for the rescuers to see the rescuees. Wasdale said it’s only happened a handful of times. I wanted to go back there; I wanted to say thanks. John France, from Melling, near Aintree on Merseyside, had a very different experience in the Lake District and can remember it vividly. The 56-year-old experienced climber was with three friends on St Sunday Crag and had just completed a grade II winter route on Pinnacle Ridge and had unroped beyond the top of climb when the snow on the gentle slope ‘turned liquid’ propelling the four men back down the mountainside. Two of them were seriously injured, one critically, and another suffered a broken ankle. Mr France escaped injury but was forced to deal with the unfolding scene and call in mountain rescue. He said: “We were due to climb in Scotland, but there had been a very heavy snowfall, so we decided to stay up at Beetham Cottage up at Patterdale and do some climbing in the Lakes as the road conditions were so back. “We decided the best course of action was to climb a ridge rather than a gully because of the heavy snow. We went up in perfect conditions. There were ice crystals in the air; it was a beautiful day. “We had all climbed in Scotland; some in the Alps, so we weren’t rookies. We got to the top of the route and took the rope off. “There’s just a small slope of about 10 degrees from the end of the rock-climbing that finishes in a pronounced ridge. I was in front. As I reached the ridge, the snow went liquid under my feet and I went backwards. Mr France phoned 999 to alert mountain rescue. “Once I’d rung them, I gave my phone to my friend and told him to stay up there. “I actually rang the emergency services twice; the second time I demanded they tell me my location, because I didn’t want the anxiety of thinking: have they not got the right location. I told my friend to stay there and co-ordinate, because there probably isn’t a signal lower down. “I took his axe and descended the gully at speed. When I went back in the spring, I saw I’d gone over a 30ft drop but at the time it would probably only have been about eight or 10ft because of the banking out of the snow. “Then I saw a body below me. This other friend is actually a part-time lifeboatman; he diagnosed he’d broken his femur; he’d damaged an eye socket. His helmet was still on fortunately so his head injuries weren’t too bad but there were a lot of lacerations. “I made him as comfortable as possible and covered him with a bivvy bag and loosened off his rucksack. I then proceeded down the boulder field. They had travelled down the gully on a big block of ice and been spat out, travelling at speed. “The other man was lower down, where the approach path starts. He’d gone over boulders the size of cars. In the spring when I went back, I found tramlines in the rock where his crampons were bent back on themselves. Mr France said he got his friend to put his arms round his neck then levered backwards so he could get a rucksack under him to pad him out and take the weight off the damage. “I ran back up to my other friend and assured him he would be OK and pinched as much insulation as I could from his rucksack and went back down. I said I can’t come back to you because the other man was in shock – he was in a very bad condition – so all I could do at that point was keep him warm. “Shortly after getting him stabilised and as comfortable as possible an air ambulance turned up. I toyed with the idea of getting him on my shoulder, getting him to a lower spot and throwing him through the door, I was that worried about him. “But commonsense said his injuries were so bad I could kill him. The helicopter hovered a bit then disappeared, to my dismay. I thought: you could have made an effort to put a skid down and get someone to me. I later found out there was a mountain rescue leader in the helicopter surveying the scene. “About 30 minutes later, I watched a Sea King come up the valley over Ullswater and appear to overshoot towards Kirkstone Pass, but then I rationalised and thought: it has probably landed on the cricket pitch outside Patterdale mountain rescue, which it had done. Then it came up and flew in a very swift, aggressive manner, circled us, and dropped smoke. The climber said the first person to come down to him was a very experienced mountain rescuer and the other was on his first major incident. “They worked tirelessly and soon we had about 19 mountain rescuers, including a doctor. “They stabilised the man I was with; I was being used as a prop to hold him on the slope. After about an hour someone relieved me so I could get something to eat and drink, and in the meantime I’d alerted them there was still a man up the top with a suspected broken ankle. “They eventually airlifted the man above me and flew him to Carlisle. There was talk of taking the man I was with to a flatter spot so the air ambulance could land. Fortunately the Sea King had enough fuel and daylight to come back and they did airlift him. Mr France said the Patterdale team tended to him at its headquarters with tea and sympathy – the only one of the four to be completely uninjured. “I went into streetfighting mode when I lost my axe. Nothing was going to drag me down that gully. I flailed like in a street fight, and I was pummelling the snow until I stopped. “I managed to get a lift from a paramedic back to Beetham Cottage and I was then reunited with the friend with the broken ankle at Carlisle. Then we waited for relatives and parents to turn up and see the lads. I got a taxi back to Beetham Cottage about 2am the following morning. But 11 months later, they were out skiing on Raise, even though they had been very seriously injured.